The Tigger Movie is a 2000 Disney animated feature starring characters from the Winnie-the-Pooh franchise, mostly centered around Tigger and Roo. Here, Tigger feels lonely about being "the only one" and decides to search for a tigger "family" with Roo's help. But when things get out of hand, will the others be able to show Tigger who his real family is? This film is notable for being Pooh's first theatrical endeavor since 1983's Winnie the Pooh and a Day For Eeyore, and the first Disney film to feature songs by The Sherman Brothers since Bedknobs and Broomsticks in 1971. A Day in the Limelight: Expectedly, for Tigger. Roo also plays Supporting Protagonist for a lot of the film. An Aesop: Family isn't just about who you're related to; it's about who cares about you. Aren't You Forgetting Someone? : Roo until the end. Art Shift: The credits tell the film's story drawn in the style of E.H. Shepard's illustrations from the original Winnie the Pooh books. Ascended Extra: Roo starts to become a major character from this film onwards. Tigger: But the most wonderful thing about tiggers is I'm the only one! Award-Bait Song: "Your Heart Will Lead You Home " by Kenny Loggins. Adult Fear: When Roo attempts the Whoop-De-Dooper Loop-De-Looper Alley-Ooper Bounce at the 'Tigger Family Reunion', the rest of the crew generally looks concerned, but his mother Kanga is horrified. Big Brother Worship: Roo's idolisation of Tigger is put into spotlight in the movie, and why he looks up to him so. He wants a big brother. Big "NO! ": Tigger shouts this when his friends try to get him to come home in the snow. Break the Cutie: Tigger starts to feel more and more alone and crushed as he fails to find his family. Roo is also left in tears when Tigger storms off after he finds out the others' deception. The Bus Came Back: Since around the middle of the New Adventures of Winnie the Pooh series, Kanga and Roo had more or less vanished from the Disney franchise besides a couple minor appearances. This film marked true return as mainstays, with Roo even becoming a more central character from this point. Comically Missing the Point: When Tigger says that his "family" is coming to see him, everyone gets an Oh, Crap! expression except Pooh, who says he can't wait to meet them. Crisis Makes Perfect: Tigger shows Roo the Whoop-De-Dooper Loop-De-Looper Alley-Ooper bounce. Roo can't do it at first, nor later when he's practicing before bedtime. At the end, he has to do it to save Tigger from an avalanche. Darker and Edgier: Not to the level of Pooh's Grand Adventure, but still. It addresses the unfortunate implications of Tigger being the Last of His Kind, talks about loneliness, depression, and the virtue of family, and even has the title character nearly get killed by a landslide! Death Seeker: Implied that Tigger plans this if his "family" is not coming. Rabbit: Are you crazy? It's not safe out here. Tigger: Exactakly! That's why you should all go home where it is safe. But I've got to wait here in my family tree for my real family! The Grasshopper and the Ants: The film's side story involves the other animals blowing off preparing for the winter to help Tigger with his crisis. Rabbit represents the diligent ants warning them to take heed, though ultimately even he takes pity. Deconstructed when, for their loyalty, Tigger ends up supplying for them in the end. Group Picture Ending: The movie ends with a shot of the group photo of everyone Christopher Robin took for the locket, which then closes up. Hair-Trigger Avalanche: Tigger shouting at his friends to leave him to find his family causes the avalanche in which the climax takes place. Heroic BSoD: Tigger has one whenever he can't find his family tree, but it hits particularly badly before the avalanche, to the point of tearfully screaming at his friends to leave him alone. Heroic Sacrifice: Tigger gets caught in the avalanche after making sure every last one of his friends was safe up on his family tree. Insane Troll Logic: When Tigger tells his friends that the letter from his "family" says they're coming tomorrow, despite it not being written in the letter. Owl: Now where did it say that exactly? Tigger: Exackatackly nowhere per se, 'cause with us tiggers, you got to read be-twixt the lines. Interactive Narrator: As is the standard for Winnie the Pooh stories, though due to the more sombre story, it's used more sparsely than normally. Jerk with a Heart of Gold: Rabbit can quickly lose his temper with the others and especially with Tigger, but he needs surprisingly little persuasion from the others to lead them in finding Tigger, in the middle of the winter blizzard he spent the film worrying about. Last of His Kind: Tigger's "The wonderful thing about tiggers is that I'm the only one" quote actually turns out to be true in this movie. And unlike the other films, it's genuinely Played for Drama. The Leader: Played with in a similar manner as the previous movie. During the climax when Roo begs for help finding Tigger, Pooh enlists the others in forming a search party, but immediately passes control over to Rabbit, insisting he is the only one smart enough to lead them. Liar Revealed: After several attempts to tell Tigger the truth about the letter fail, the others decide to pose as Tiggers so as not to upset. However Roo's disguise falls off and Tigger realises he has been duped. Played with, since he only gets as far as realising the disguise is fake and still clings onto the letter as legitimate proof his family exists. Literal-Minded: Owl suggests to Tigger that he should 'look up his family tree' to find his family. Tigger goes looking for an actual tree full of Tiggers. Melancholy Musical Number: "The Wonderful Thing About Tiggers" gets a Dark Reprise when Tigger realizes that he might not actually have a family. Poor guy is almost in tears during it. Tigger: I'm... the lonely... one. My God, What Have I Done? : The others, especially Roo, when their deception leaves a hurt and disillusioned Tigger trudging into the blizzard alone to find his family. Eeyore mentions Pooh has a habit of getting stuck in places. Later, Piglet nervously asks Pooh before the avalanche starts to hit, if he has a "rumbly in his tumbly." A minor example, but Piglet inadvertently makes the bees chase Pooh and his friends by tapping on the bear's rump and causing him to fall into the hive. Roo attempting the Whoop-De-Dooper Loop-De-Looper Alley-Ooper Bounce leads his disguise to fall off and for Tigger to find out about the others' deception. 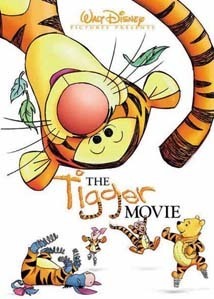 No Antagonist: The conflict of the movie comes from Tigger trying to find where his family is and the emotional struggle he and Roo face with that, rather than from a person. In this movie, Tigger is incredibly sad about not having a family. Even his uniqueness, one of the things he most proud of, makes him realize that he's the only tigger. Needless to say, Roo wants to make Tigger feel better as soon as possible. When Tigger finds out the others pretended to be his family, he vents a very uncharacteristic moment of Tranquil Fury before storming off, making it obvious to the others they've hurt him in a very big way. Roo himself usually can surpass Tigger as the wood's Keet. After his Big Brother Mentor turns his back on him however, he spends most of the climax very morose, when not outright crying. Punctuated! For! Emphasis! : "For my! Real! Family!" Please Don't Leave Me: Roo to Tigger after the avalanche, with Tigger still lamenting over seeking his family. Shout-Out: Unusually for a Pooh film, the song "Round My Family Tree" contains many pop culture references, from The Brady Bunch to Jerry Springer to The Seven Year Itch. Some scenes are reminiscent of the original Pooh featurettes of the 1960s and 1970s. The illustrations that accompany the end credits are remeniscent of E. H. Shepards's illustratons for the original Pooh novels, and the characters are depicted like Shepard drew them. All through the movie Roo wishes for Tigger to be his big brother, and at the end Tigger calls him "my bestest little brother." In the original novels, Tigger does become Roo's big brother when Kanga adopts him at the end of his introduction chapter. Supporting Protagonist: As much of the film is focused on Roo's bond with Tigger as the latter's own quest for his family. Tears of Remorse: Roo breaks down sobbing after his trick to pose Tiggers angers him into leaving. Tone Shift: Who would have thought that the film focused on Tigger would be one of the darkest and most emotional films in the Winnie The Pooh series? True Companions: The ultimate theme of the movie - Tigger's true family aren't the others of his kind (whether they exist or not), but the dear friends who stood by him no matter what and searched him out in a snowstorm out of concern for his safety. In the end, he realises that this is enough. Undying Loyalty: Roo refuses to leave the despondent Tigger. The other animals, and later even Rabbit, ultimately join in helping him. Vitriolic Best Buds: Tigger and Rabbit, as usual. Especially notable during the aforementioned scene under Death Seeker; for all that they argue over and as short-tempered as Rabbit gets, neither wants the other in danger. Tigger: Coz somewhere out there's a Tigger family tree, full of my real Tigger family. I've got a letter here to prove it! And I'm gonna find 'em. So...TTFE. Ta-ta...forever! What the Hell, Hero? : As exemplified by the above Wham Line, Tigger is left rather upset when he finds out his friends duped him into believing his family had contacted him.